Tunisia is only a two and a half hour flight from London and so it has been a destination for British travellers for years. Only 80 miles south of Sicily, Tunisia is roughly the size of the UK, but offer a warm Mediterranean climate in the north and a Sahara heat in the south. 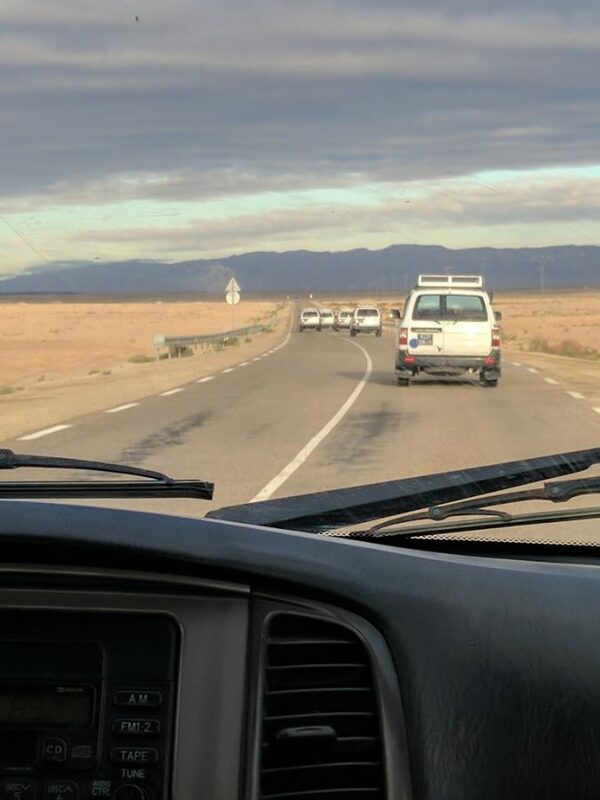 I’m off on a very quick 2-day road trip to explore some of the hidden gems of Tunisia and to get a feel for what the traveller can enjoy there. And I want a break from the cold and wet UK weather. Landing at Tunis, with a short hop down to Tozeur in the midwest of Tunisia, I spend the first night in the family 4-star El Mouradi Hotel. 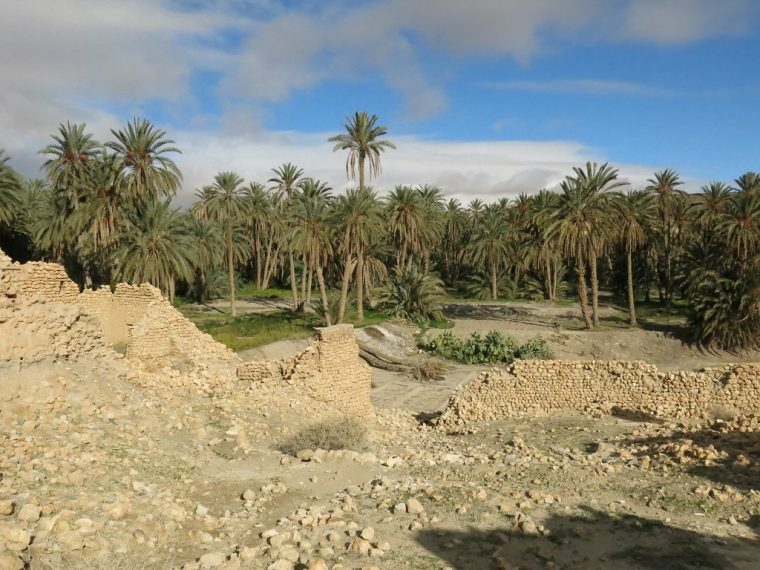 Tozeur is an important town and sits on the edge of the 7000Km square salt lake of Chott El Jerid. I arrive just as the bi-annual four-day Festival of the Oasis is about to start. The hotel is full of Tunisian families having fun, and everyone is welcoming. 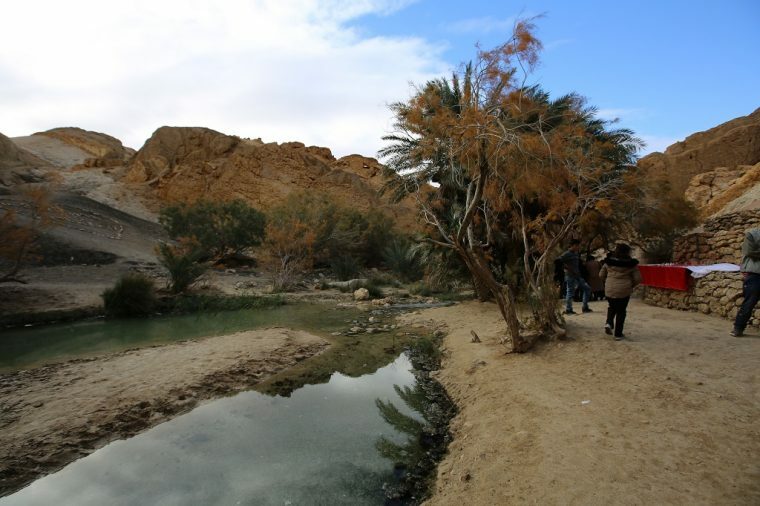 My first stop is the oasis at Chebika, north of Tozeur by the Algerian border. The best time to visit is early in the morning so I depart with my tour guide just before sunrise, yet still manage to join a few other intrepid travellers all with guides in the desert vehicle of choice – the Toyota Landcruiser. About 45 minutes later we arrive at the oasis, which really epitomises my idea of the word. A beautiful patch of green grass and date palm trees surrounded by dry rocky desert and imposing mountains. The mountains seem to appear from nowhere as if they are the spines of monsters coming out of the ground. The water oozes out of the ground, forming a pool, then overflowing to create a waterfall. You can drink it unfiltered but as you put your hand in you’ll be surprised by how hot the water is. 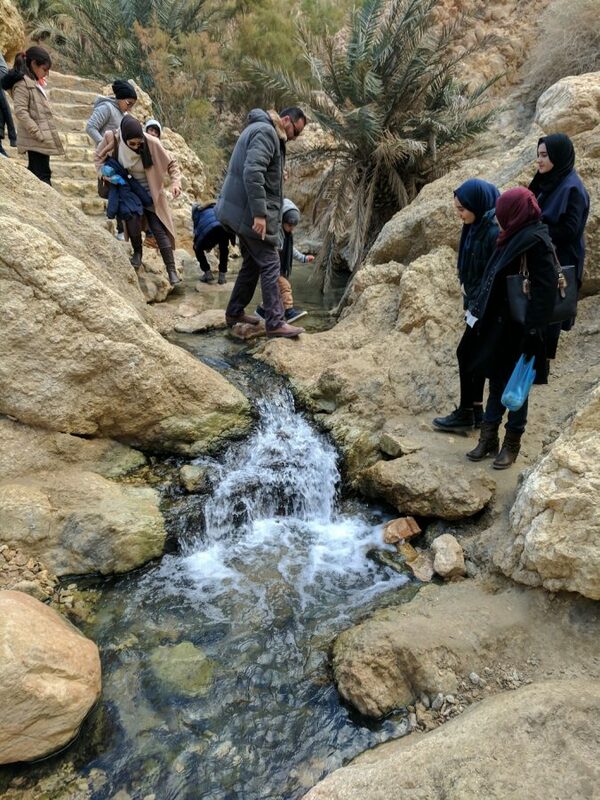 This is a desert oasis and the water is about 30c. I try some (it’s soft and tastes like vanilla!) and splash a lot on me to stay cool in the rising sun. 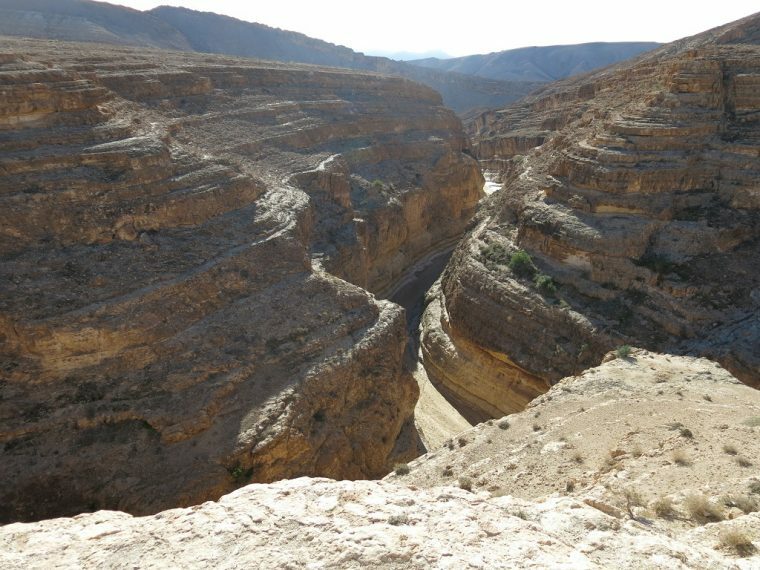 Moving 10 minutes further west, the narrow, winding road to Tamerza climbs beside a 1km high gorge which winds precariously with several tight hairpin turns. This is where scenes from the Film ‘The English Patient’ were shot, and of which Kristin Scott Thomas said ‘the most astounding thing about the desert was simply the silence’. Here you can look down at the precipitous gorge and be amazed by how water is being pushed out of the high ground. And, as we are first up the mountain and ahead of the other tourists, I have this space all to myself. The desert and the mountains that rise out of it are amazing, so desolate that the place has a magic about it and a feeling of being in another world. 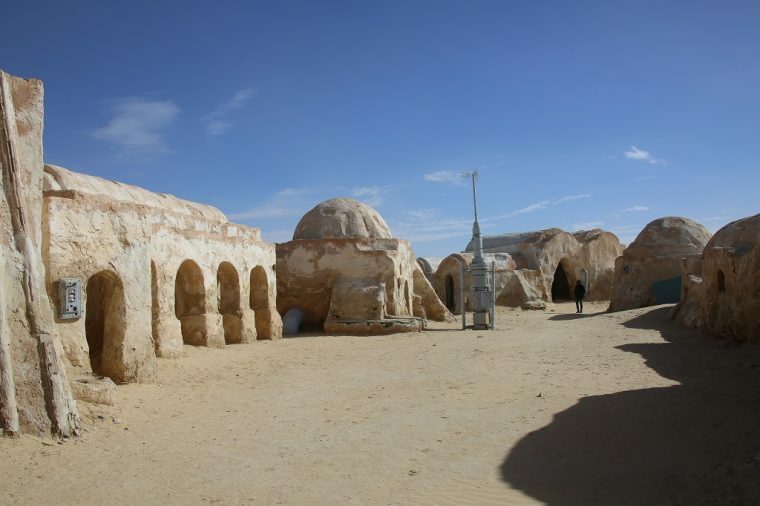 So, it is no surprise that many films have been made in this area, probably the most famous one being Star Wars. 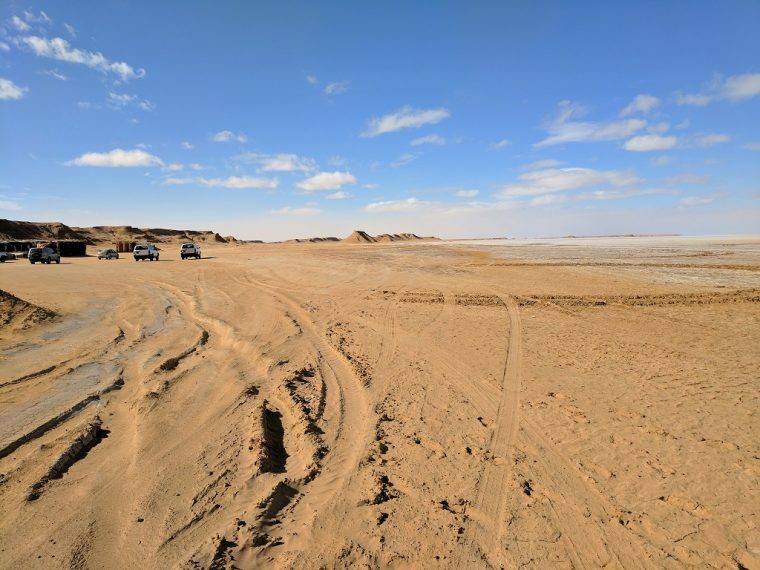 Now, a drive out of the mountains, back through Tozeur and into the sandy desert of Nefta, takes us to the Space Port of Mos Espa and the Juntland Wastes. The road from Tozeur comes to an end miles before the location of the site, and we drive out on tracks into the desert. Moving on, the rocky desert changes to the pure sand of the Sahara, and the shimmering site of the Chott El Jerid salt lake. We stop, literally on the salt flats, to take in the scale of the environment. At 7000Km square it is massive and looks just like an ocean. The sand has a covering like silver, each sparkle is a grain of salt on the surface. This is part of huge natural inland marine oasis – meaning it is salt water. As far as you look it glistens, and yet there is nothing you can drink here. Pushing on for a few more miles we enter the Sahara desert as we know it. The sand here isn’t like beach sand. It is much finer and ever-surrounding, almost intimidating in its never ending scale. 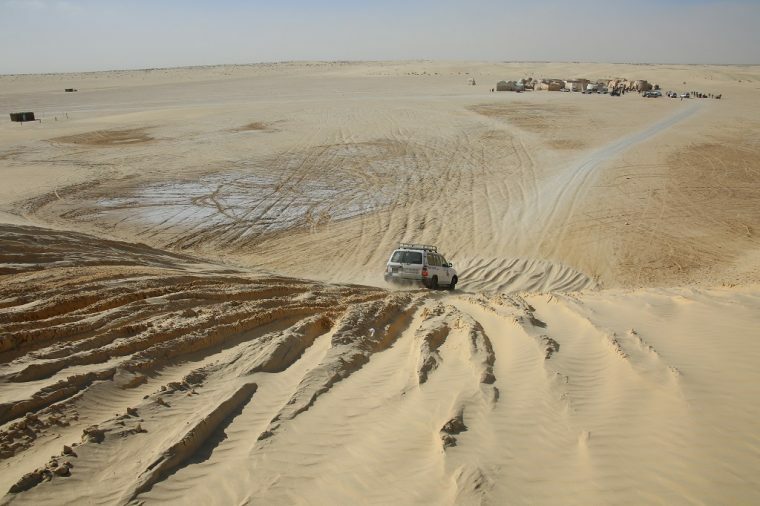 Sand dunes rise and fall, and the guides have fun driving the 4x4s as madly as they can up and down them to show what they can do and scare the tourists. Scream if you want to go faster! Coming over the top of a dune you see the Space Port. It is so like the movie that it shocks you. Driving down you can park next to the camels and explore. It’s a fun place to visit, and film buffs will love it. 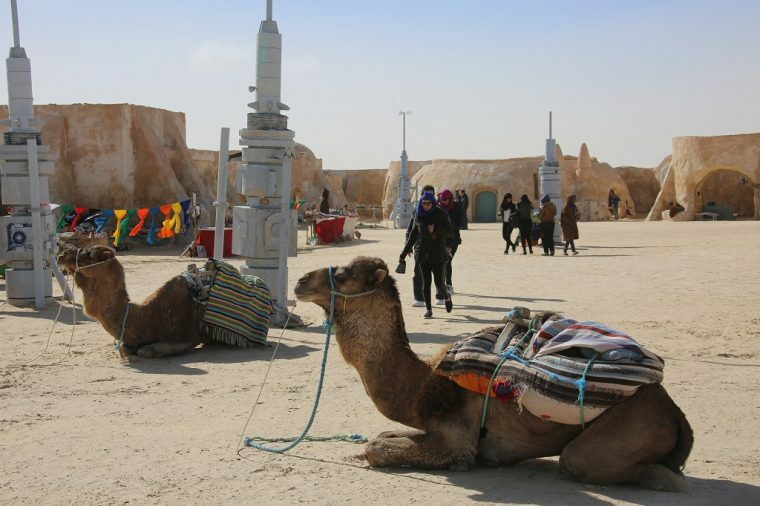 There are a few locals selling items from the desert and camel rides for those brave enough, but never any hassle and you are free to explore and take pictures. As the sun gets up it is time to head back to Tozeur, but you could spend all day here, watching the sand and the desert, and how the lines and patterns change with the movement of the sun and the breeze. If we had more time we could also have visited the troglodyte homes at Matmata, the location used for the opening scenes in Star Wars as Luke’s home. The longer you stay here the more you find out how much this area has been used in films – possibly because it is such a hidden gem to most people. 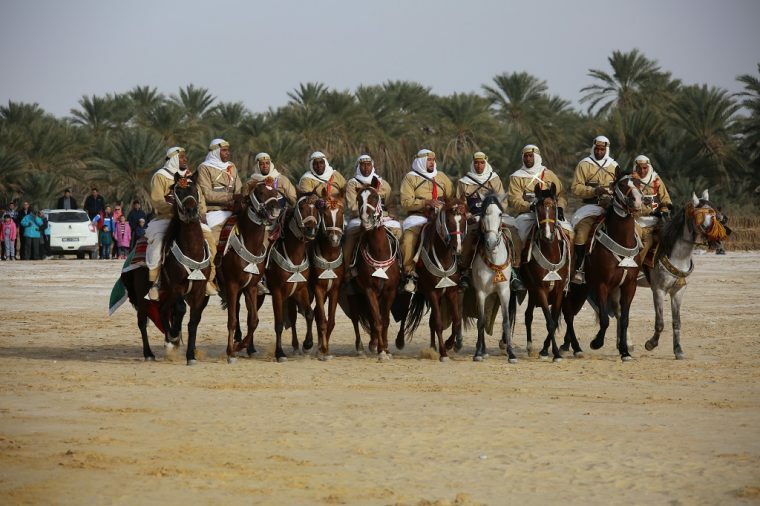 Back in Tozeur, thousands of people are flocking to the opening event of the Festival of the Oasis, a huge gala event with different bands of musicians, horsemen, dancing etc, all showing their skills from their regions. 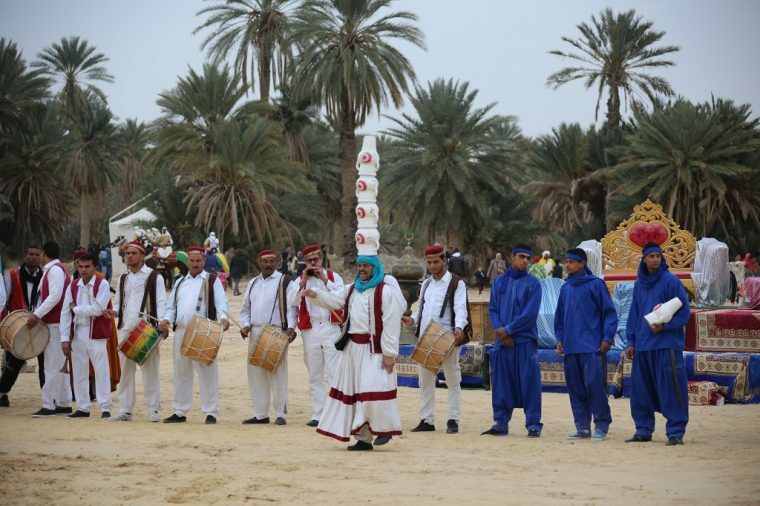 The 4-day festival includes traditional music through to live techno trance, archery, falconry, a wide display of art and crafts, mixed drama and of course food. The evening we head out into town to see one of the live bands. The streets are heaving with people of all ages, and we are treated just like any another spectator. The music is loud and colourful; people sing along or wave enthusiastically. A few shops are still open, but most people are here for the music – it looks as if most of the town are actually taking part. After a full day, it was time to head back to the hotel and to bed. Tomorrow is the road trip back to Tunis – Part II of my journey, to follow. 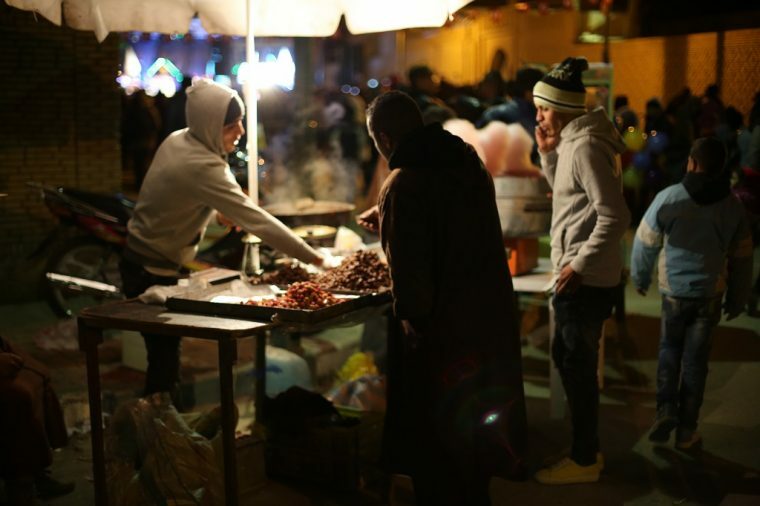 Interested in a Tunisian Road Trip? Why not pin this post for later! Lovely trip. I went to Tunisia once. Lovely place to visit. Love the food buy I won’t go back. I visited Tunisia 7 years ago. It’s so amazing! Stunning scenery! 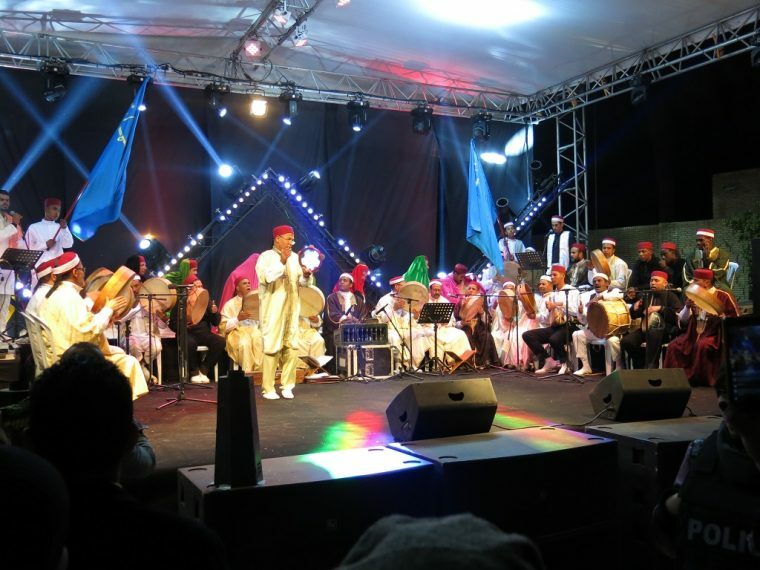 It looks like an incredible and varied experience from a tranquil oasis to the live music in town.